Great Indian Food to Takeout in Puerto del Carmen. Variety of Indian Food - Curry Restaurant - Tandoori - More than a 100 dishes, amazing value. 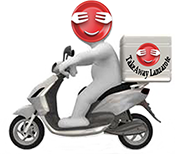 Best Indian Restaurants Takeaways with Delivery Service available for Puerto del Carmen, Puerto Calero , Tias & Macher - Lanzarote . Takeaway Lanzarote - Restaurants Puerto del Carmen Cooked with butter and rich creamy sauce. Takeaway Lanzarote - Restaurants Puerto del Carmen Cooked in a special onions,sauce,ginger,garlic. Takeaway Lanzarote - Restaurants Puerto del Carmen Cooked with a very thick gravy onions,tomatoes,curd and various spices. Takeaway Lanzarote - Restaurants Puerto del Carmen Cooked with spinach, aromatic herbs and spices.